August 29, 2016 - "Press Releases"
MEGA Electronics Inc introduces the new IEC C13 Lock Rewireable - the world’s first locking rewireable C13 IEC connector. Designed to guard against accidental disconnection of computers, PDUs, servers and most network devices, the new IEC Lock adds additional flexibility and ease of use, as well as LSZH (low smoke zero halogen) compatibility, to its list of features. The beautifully straightforward high-visibility locking mechanism is combined with a simple release mechanism which allows for disconnection from all sides. Ideal as a retrofit solution, it requires no other equipment or special inlets to secure it, simply plug it into an appliance as you would a standard IEC lead. 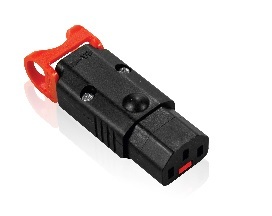 The red cage release mechanism also marks the connector out from standard IEC leads to allow maintenance and other data centre staff to identify critical power sources. Its slim design means it can easily be implemented in areas where access is limited and ease of removal is of paramount importance. Its LSZH attribute is crucial for critical applications in military, broadcast, transportation and data centers. For more information about the IEC Lock product range including the new rewireable connector, contact MEGA Electronics Inc 732-249-2656.